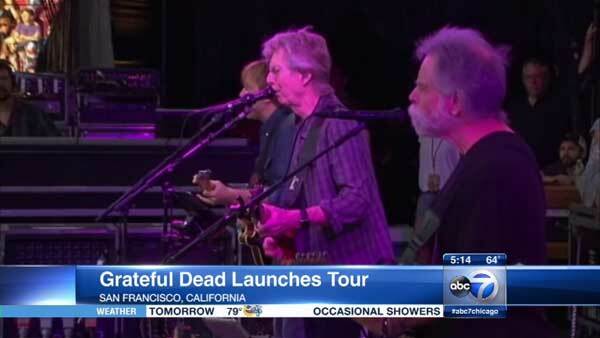 CHICAGO (WLS) -- The Grateful Dead will play the final three shows of their farewell tour at Soldier Field this weekend. 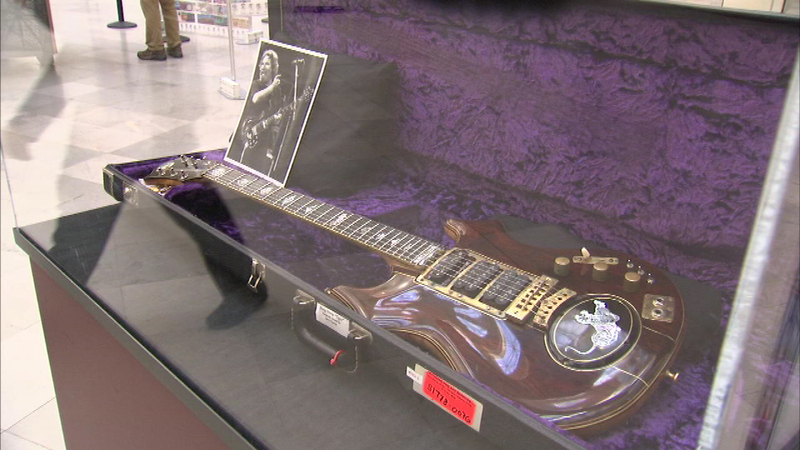 The Field Museum is hosting a special exhibit this week called "Everything is Dead," featuring Grateful Dead memorabilia and musical performances. The Dead will play their final three performances in Chicago on July 3, 4 and 5. They kicked off their farewell tour with two shows this weekend in northern California. The "Everything is Dead" special exhibit at the Field Museum runs through Sunday. The exhibit features band memorabilia. The group performs at Soldier Field Friday, Saturday and Sunday. The songs still ran long. To the uninitiated, the communal rituals of the faithful fans probably looked strange. Was it trippy? Well, this was a Grateful Dead show, after all, the first in a handful over the next week that are said to be the last. The four surviving members of the Dead, joined by a trio of well-versed companions, launched their "Fare Thee Well" mini-tour Saturday night in Northern California, where the legendary jam band got its start 50 years ago and almost two decades after the death of beloved lead guitarist Jerry Garcia. During a performance that featured a little more than 3 hours of music, the group's so-called "core four" - rhythm guitarist Bob Weir, bassist Phil Lesh and percussionists Mickey Hart and Bill Kreutzmann - unreeled a set list featuring both crowd-pleasers and obscure pieces from their early catalog. The band got the Levi's Stadium crowd of about 80,000 into its customary loose-limbed groove at the start with familiar renditions of "Truckin'" and "Uncle John's Band." From there, the rest of the first set veered unevenly through "Cumberland Blues," ''Born Cross-Eyed" and a 20-minute-long "Viola Lee Blues" that gave Phish front man Trey Anastasio, who had the honor and pressure of serving as Garcia's surrogate on guitar, his first challenge on a solo. As "Viola Lee" was ending, a rainbow arced across the sky above the stadium like a smile from beyond. The majority of the audience, which included former flower children with more than a touch of gray in their hair as well as millennials who were babies when Garcia died - were inclined to appreciate every chord, so grateful were they just to be there. "I'm in the right place at the right time and all the right people are here with me and it's all perfect," said Sabrina Donahue, 47 of Montana, who attended the show with her "best hippie soul sister" - a veteran of over 300 Dead shows in the late 1980s who now works as a school district superintendent in California. "The only difference is we're keeping our shoes on now," the educator, Michelle Hutchins, 47, said. The parking lots around the stadium had more Subarus and luxury sedans than VW buses. There were fewer vendors selling tie-dyed T-shirts, glass pipes and jewelry than in the past, but enough to remind tailgating concert-goers they were in the right place. "I have this feeling about all the bands from the 60s - you want to see them one more time because they gave you so much," said Larry Johnson, 64, of Seattle, who went with three college buddies. The second half of Saturday's show got off to a slow start as the reunion band, which included Bruce Hornsby on piano and keyboards, struggled to find its footing on "That's It For The Other One" and "Dark Star." "To me, this show feels like a big rehearsal," Erik Keegan, 39, of Southern California observed, adding that he was still enjoying himself. "The notes are all there but they don't add up." The energy started to rebuild when they tackled the iconic "St. Stephen." Anastasio delivered his finest fretwork on the song. Per Dead tradition, Hart and Kreutzmann fully re-engaged the audience with "Space," an improvised percussive interplay accompanied by rhythmic psychedelic graphics. Bob Weir, the former baby-faced band heartthrob who now has a full head of white hair and a bushy beard that makes him resemble the Lorax, came alive while singing "That's It For the Other One" and taking the vocal duties that used to fall to Garcia on "Morning Dew." The Grateful Dead are scheduled to play a second show in Santa Clara on Sunday before heading to Chicago for three shows. Soldier Field is where they last played as a group before Garcia's death at age 53. Although the original band members say July 5 will be the last time they perform together, they all have their own bands or musical projects and have teamed up as pairs for select gigs. "This is the end, but it isn't the end," said John Fauth, 20, of Oregon, who discovered the Dead two years ago around the time he bought a VW bus. "The community can't just die."